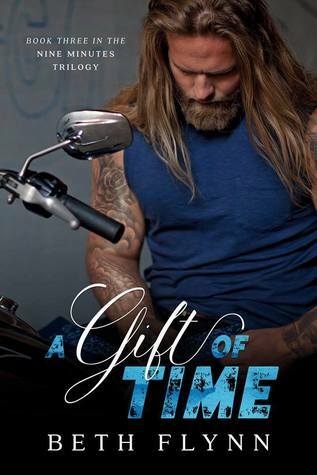 A Gift of Time was definitely a book of two halves for me. The first half was a mass of crazy time jumps where I had to be on my toes, it was confusing and I found myself having to go back and check the year several times so that I could really get to grips to what was unfolding around me. I loved the chapters of Grizz’s time in prison and just how dominant he was on the inside and how far his reach and power went from within his cell walls. I have always loved Grizz for the complex villain that he is, a man that you should hate, yet somehow can’t. He made more enemies than friends and Grizz deals the only way he knows how. But, how the execution was explained though, was to me laughable, this has always been an integral part of the plot and I wanted to know how, the brief skirting of the subject just made it seem like a joke. Beth Flynn really creates the perfect family unit between Grunt/Tommy and Ginny, and regales us with the lives that they have lived since the execution and how the children have grown up. I found myself feeling that I was being force fed just how perfect they were together and at times it was unsettling. Mimi was a great character though and there was one plot line in particular between her and Tommy that I felt was superfluous and was adding drama for drama’s sake, especially when that topic was revisited a few times. My main gripe with this book though was the ending, not the end result, because that was a foregone conclusion in my eyes, but what happened to get there. For me it was a cop out. The battle is taken away, its lazy writing. If you are going to go the love triangle route, at least make it a fight, let there be a victor, let the person in the middle make the choice. If you follow my reviews then you know how much I loved Nine Minutes, it was one of my favourite books for that year and I adored the creativity and storytelling of Beth Flynn. Unfortunately, I didn’t like Out of Time, the author had taken it on a tangent that was way off for me, throwing all sorts of plot devices into the mix and to be honest I was expecting aliens next. In A Gift of Time though, most of them are never mentioned or they are not really explored at all or expanded upon. This makes me wonder why they happened in the first place and if Beth Flynn changed her outline of book three to take into account the criticisms of book two, but in doing so, took too much away from what the story for Tommy, Ginny and Grizz should have been. After Nine Minutes I think my expectations were just too high, that book was so perfect that anything following it would never be good enough. Although I am not a fan of Out of Time or A Gift of Time, Beth Flynn gave me one of my most memorable reads in Nine Minutes and that is one book that I will forever hold dear.